Free Flash Disk shipping cost to the rest of INDONESIA for the purchase of products in our Online Shop. We receive your payment by PAYPAL or Credit Card Payment. Terms and Conditions Apply. Our Customer service is ready to help you for any problem to shopping at our Online Shop. FULL SUPPORT 24/7. 1. Contract form for Excom, Spv & Rank & File. 23. Staff hired and staff resign board. 8. Manpower planning by hour. 9. New employee orientation checklist. 17. Staff leave n holiday planner. 1. Template for Best Employee of the Month Selection (BEOTM). 2. Hotel Business Plan Template. 1. Aplikasi Excel: Test Kepribadian Skala MBTI. 2. 16 Tipe Kepribadian MBTI. 3. Membaca Kepribadian dengan MBTI. - Cara mudah membuat anggaran Hotel (budgeting), lengkap dengan standard rasio prosentase masing2 revenue dan expenses, dan dalam template tsb, kita hanya memasukan: Days per Year, Number of Room Built, Occupancy Rate, dan Average Rate Net, dan → Otomatis akan ter-input kesemua statement of income sesuai Hotel ratio prosentase yang sudah diformat sesuai standard Hotel. Begitu juga dalam Income Synthesis, P&L Room, P&L Rest&Bar, P&L Telephone, P&L Bus.Center, P&L Fitness&Spa, P&L Other Income, P&L Admin, P&L Sales, P&L Personnel, P&L Pomec, akan terinput secara otomatis. Template ini, akan memudahkan pihak owner ataupun management (GM) dalam menentukan GOP ataupun NOP yang diinginkan. Materi tersebut yang merupakan panduan untuk set up Hotel Pre Opening atau Hotel yang sudah Running namun perlu diperbaharui sistem akutansi nya, lengkap juga dengan materi control policies..
1. Hotel Business Plan Template. 4. 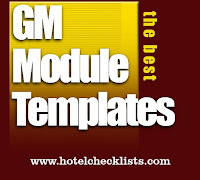 Hotel Opening Manual for GM. 5. Hotel Project Punch List. 6. Sales Marketing Pre Opening Manual. 2. Detail Budget - Department / Manning Expenses. 9. Critical Path all Departments. 12. Back of house work flow chart. 13. 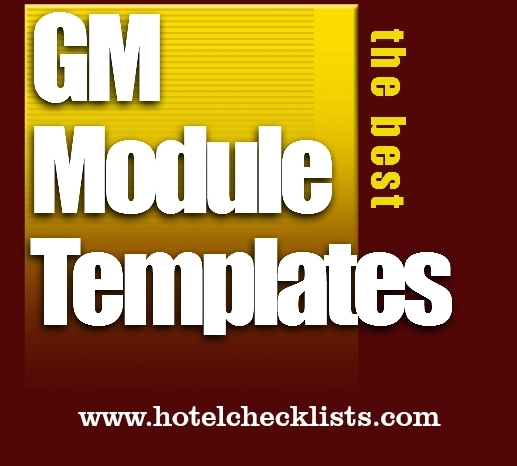 General manager review template. 16. Hotel pre opening checklist. 19. Kitchen pre opening checklist. 7. FO room sales control. 10. Restaurant & Bar checklist. 11. Restaurant & Bar Service Audit. 13. Kitchen & staff facility audit. 1. Food safety assessment checklist. 4. Hotel mystery guest audit. 5. Hotel mystery shopper program. 6. Hotel reward and recognition program. 3. Review on trip advisor. 5. Poster - fire emergency. 10. Service team self assessment. 11. The door hanger checklist. 7. Sales & Marketing SOPs. 4. 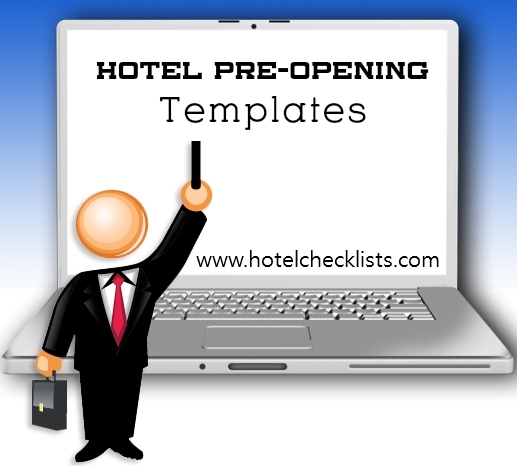 Hotel Pre Opening Checklist. 5. Kitchen Pre Opening Checklist. 3. Club Membership Processing Manual. 5. Hotel Fire Safety Manual. 6. Hotel Health & Safety Manual. 7. 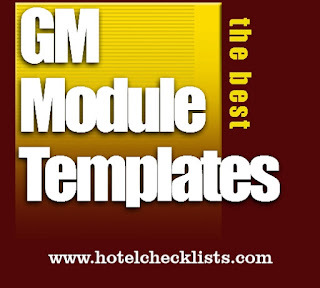 Hotel Opening Manual for GM. 10. Manager on Duty Manual. 13. FB Cost Control Manual. 19. Sales Marketing Pre Opening Manual. A. 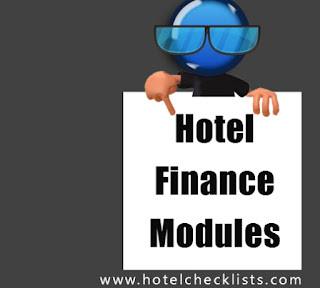 Complete forms in word format, re: Hotel reporting FORMATS, FORMS, CHECKLISTS, ASSESSMENTS, AUDITS, & GUIDELINES. B. 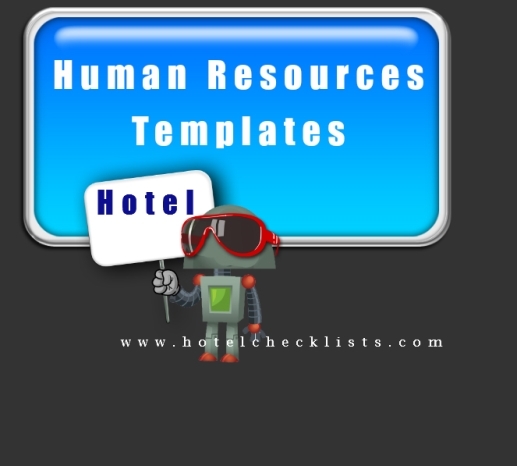 All Templates for all Departments in excel & word format. - Estimation electric & water Consumption for banquet/room. 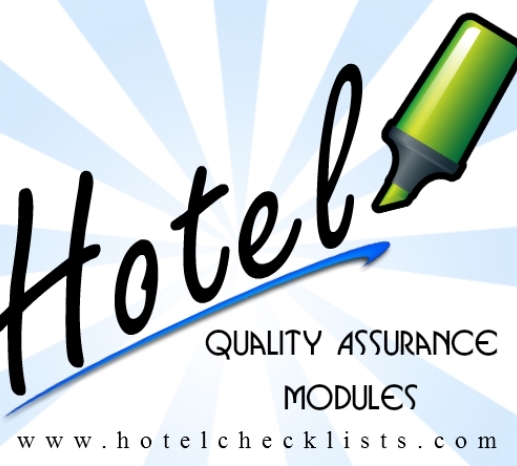 - Hotel preventive maintenance checklist. 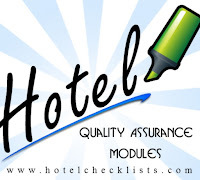 - Hotel yearly maintenance plan. - Banquet beverage control sheet. - Buffet menu pricing worksheet. - Cashier shift end report. - Daily bar requisition master template. - Daily food prep forecasting program. - F&B cost of sales analysis. - F&B flash cost report. - F&B menu item cost analysis. - F&B promotions profit n loss statement. - F&B weekly cleaning duty. - Food stock take program. - In room dining conversation standard. - Monthly beverage reconciliation report. - Sequence of service flow chart. - Weekly F&B cost analysis program. - Budget template all departments. - Detail budget : department expenses. - Detail budget : manning expenses. - Hotel chart of accounts. - Hotel daily reconciliation report. 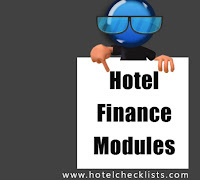 - Hotel financial summary statement. - Master pay in sheet. - Profit n loss report. - Store months end inventory report. - Hotel room pricing method template. - Hotel comparison & yield analysis report. - Daily no show report. - Monthly no show follow up report. - Rebate & deduction report. - Estimation electric & water consumption for room/banquet. - Hotel cost per room in details. - Contract form for Excom, Spv & Rank & File. - Staff hired and staff resign board. - Manpower planning by hour. - New employee orientation checklist. - Staff leave n holiday planner. - Kitchen station production sheet. - Kitchen weekly cleaning schedule. - Back of house work flow chart. - Hotel business plan template. - Ad hoc rate request form. - Competitive benhmark & pricing analysis. - Hotel market penetration report. - Hotel sales marketing distribution plan. - Reservation forecast pick up. - Sales dept. training matrix. - Special contract rate request. - Presentation internal control audit. 1. Sales Distribution Budget 2. Room Costing 3. Food Coster 4. Break Even Analysis 5. Business Budget 6. Business Debt Tracker 7. Business Plan 8. Company Five Year Projection 9. Company Target Analysis 10. Direct Marketing Analysis 11. Estimating Star up Capital 12. Event Planning Budget 13. Expenses Estimation 14. Financial History & Ratio 15. Financial Statement 16. Flexible Budget 17. Marketing Budget 18. Weekly Planner & Tracker 19. Marketing Budget Plan 20. Marketing Calculator 21. Profit & Lost Projection 22. Pro Forma Balance Sheet 23. Pro Forma Income Statement 24. Proforma Invoice 25. Sales Commission Calculator 26. Sales Effectiveness Score Card 27. Sales Forecast 28. Sample Marketing Plan 29. Small Business Cash Projection 30. Small Business Valuation 31. Start up Capital Estimate. Your pre-opening checklist is one of the best I have seen, and those who are developing, under construction, or need guidance, can use the check list to execute action steps, for a smooth opening. Wow! All are world class templates. I bought all your templates and all are excellence, Thanks..!! Copyright © 2016. 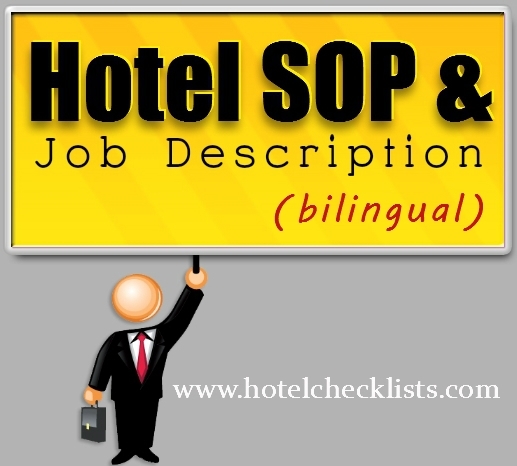 Hotel Checklists Allright reserved.